I started working in national parks over 20 years ago. I have worked in too many parks to list. In South Africa, I lived and worked in the Hluhluwe-iMfolozi Park, which is home to the “big five” and is the oldest nature reserve in Africa. I also worked in marine parks on mapping and categorising reefs for better management, and an experimental approach with Indigenous communities to manage the harvesting of intertidal shellfish. In New Zealand, I worked with marine mammals and the “swim with dolphins” tourism industry, and later with a kiwi recovery and feral animal control program. 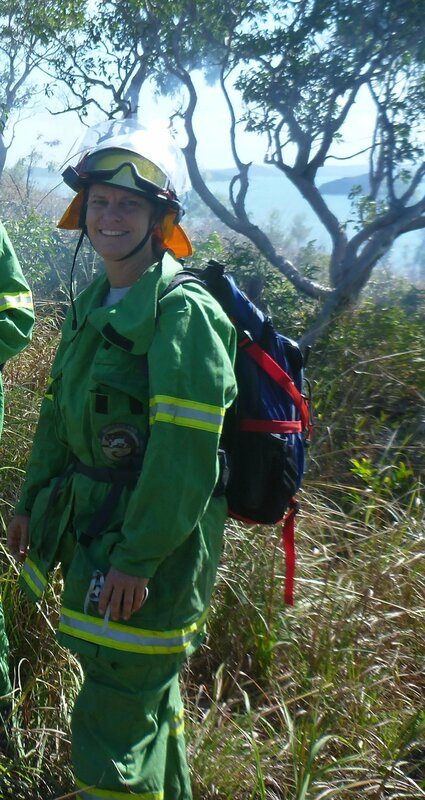 With QPWS, I have worked in national parks in the Gladstone and Cairns areas, and currently I work on island national parks along the whole Queensland coastline. My most memorable time was when I was part of a team assessing the extent and severity of reef and island damage after a major cyclone. It was a very windy and rough ten days at sea, but we explored a huge area, from the inky blue edge of the outer Great Barrier Reef to the shallow fringing reefs of small cays. I was amazed at how severe, but also patchy, the cyclone damage was. Some islands had Pisonia forests that were totally flattened and massive coral boulders were left stranded high up on the beach, while nearby reefs and islands were almost untouched. I live in Cairns and we are spoilt with many stunning national parks on our doorstep. But one of my favourite things to do is hike the Summit trail on Fitzroy Island. It is a quick boat ride to get to the island and you can camp there. Fitzroy Island has steep forested mountains; white, crunchy coral beaches and safe snorkelling on the fringing reefs. The views from the summit are awesome. In my current job I spend a lot of time at my desk, planning, advising and reviewing our conservation programs. Getting out in the national parks and seeing the outcomes of the hard work that our field rangers do is very rewarding, and often humbling. One of the best parts of my job is working with inspirational, like-minded people. Explore the smaller trails in and around your own town or city. There are great experiences to be had without travelling far. And especially in the tropics, remember to pack your swimmers and enjoy a dip in the cool mountain streams, away from the crocodiles and summer stingers. Although it involves a lot more gear and preparation (and the dreaded packing and unpacking), camping in the more remote parks where you can get away from the everyday stresses of modern life–including access to the internet—is an excellent way to reconnect with nature, your children and other loved ones.